Using a knife, cut a circle out of the top of the camembert and remove the rind lid. Add chopped sundried tomatoes, finely chopped garlic and chopped chives into the top of the camembert. Put the rind lid back on the top of the camembert and place it in the middle of a circular puff pastry sheet. 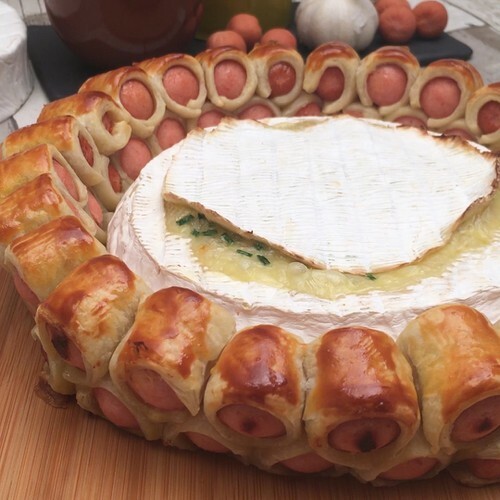 Arrange 5 of the hot dog sausages around the camembert, and fold the pastry edges over the top of the hot dogs, then cut each hot dog into fifths. Lift and rotate each hot dog piece about 90°. On the second sheet of puff pastry, cut pastry strips the size of the hot dogs and wrap them in the pastry, then cut them into fifths again. Place the wrapped hot dogs in a layer on top of the previous ones to create a double layer around the camembert, then brush the pastry with egg yolk. Bake for 20 minutes at 200°C on a baking tray. Once cooked, remove the lid from the camembert and dip the hot dogs into the fondue.